Amazon has got this WDF 150-piece "Looks Like Real" tableware in rose gold for $27.99 - $2.00 coupon = $25.99 with free Prime shipping. 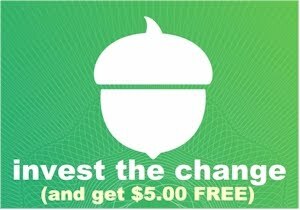 (Make sure you "clip" the coupon!) At $1.04 per place setting, that's a killer deal. This set is unrated, but I checked out other "Looks Like Real" tableware items sold by this vendor, WDF, and they all got high (4 stars or over) ratings on average. PREMIUM QUALITY: 100% food grade, non-toxic, BPA-free plastic! Made of disposable and reusable plastic that is sturdy and durable. Solid, durable, heavy-duty rose gold silverware and plastic plates ensure won't scratch or break easily. 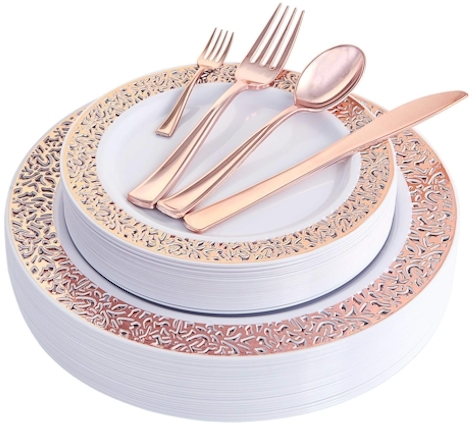 ELEGANT DESIGN: This plastic tableware set finished with shiny rose gold. 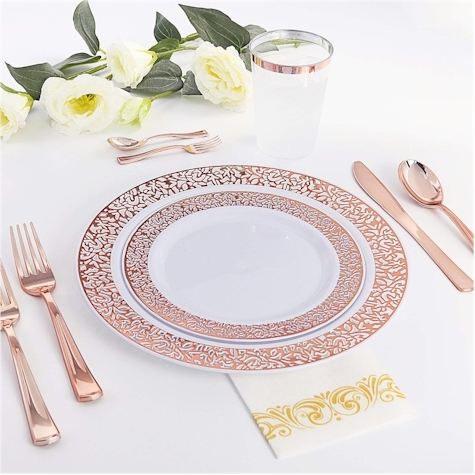 Add class and elegance using lace wedding rose gold plates and our elegant plastic silverware, that looks like the real rose gold look on your table. ALL-INCLUSIVE DINNERWARE SET: rose gold plastic tableware includes 25 dinner plates, 25 salad plates, 25 forks, 25 knives, 25 spoons and 25 tasting mini forks, Ideal for any events, sturdy construction resists breakage, bending, and snapping. PERFECT FOR ANY OCCASION: your birthday, children’s party, banquet dinner, catering event, reunion, engagement party, weddings, holiday. CLEAN UP AND SAVE TIME: When the party is over, you can spend more time with family and less time cleaning dirty rose gold disposable plates, rose gold cutlery or keep them, and reuse. So convenient.